The history of Marine Biology & Oceanography may have begun as early as 1200 B.C. when the Phoenicians began ocean voyages using celestial navigation. References to the sea and its mysteries abound in Greek mythology, particularly the Homeric poems “The Iliad” and “The Odyssey”. However, these two sources of ancient history mostly refer to the sea as a means of transportation and food source. It wasn’t until the writings of Aristotle from 384-322 B.C. that specific references to marine life were recorded. Aristotle identified a variety of species including crustaceans, echinoderms, mollusks and fish. He also recognized that cetaceans are mammals and that marine vertebrates are either oviparous (producing eggs that hatch outside the body) or viviparous (producing eggs that hatch within the body). 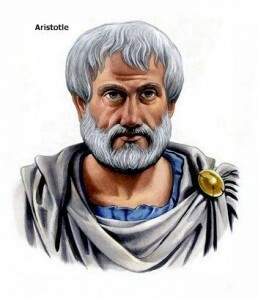 Because he is the first to record observations on marine life, Aristotle is often referred to as the “Father of Marine Biology”. 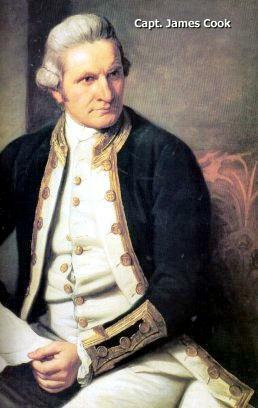 The modern-day study of Marine Biology began with the exploration by Captain James Cook (1728-1779) in 18th century Britain. Captain Cook is most known for his extensive voyages of discovery for the British Navy, mapping much of the world’s uncharted waters during that time. He circumnavigated the world twice during his lifetime, during which he logged descriptions of numerous plants and animals then unknown to most of mankind. Following Cook’s explorations, a number of scientists began a closer study of marine life including Charles Darwin (1809-1882) who, although he is best known for the “Theory of Evolution”, contributed significantly to the early study of Marine Biology. His expeditions as the resident naturalist aboard the HMS Beagle from 1831 to 1836 were spent collecting and studying specimens from a number of marine organisms that were sent to the British Museum for cataloging. 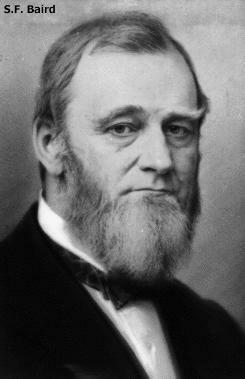 His interest in Geology gave rise to his study of coral reefs and their formation. His experience on the HMS Beagle helped Darwin formulate his theories of natural selection and evolution based on the similarities he found in species specimens and fossils he discovered in the same geographic region. The voyages of the HMS Beagle were followed by a 3-year voyage by the British ship HMS Challenger led by Sir Charles Wyville Thomson (1830-1882) to all the oceans of the world during which thousands of marine specimens were collected and analyzed. This voyage is often referred to as the birth of Oceanography. The data collected during this trip filled 50 volumes and served as the basis for the study of Marine Biology across many disciplines for many years. Deep-sea exploration was a benchmark of the HMS Challenger’s voyage disproving British explorer Edward Forbes’ theory that marine life could not exist below about 1,800 feet. The HMS Challenger was well equipped to explore deeper than previous expeditions with laboratories aboard stocked with tools and materials, microscopes, chemistry supplies, trawls and dredges, thermometers, devices to collect specimens from the deep-sea and miles of rope and hemp used to reach the ocean depths. 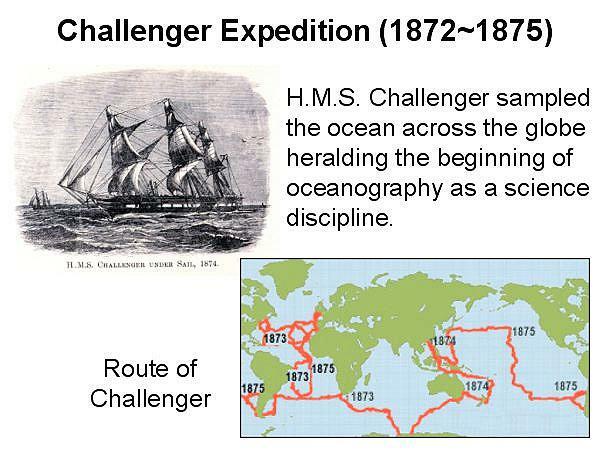 The end product of the HMS Challenger’s voyage was almost 30,000 pages of Oceanographic information compiled by a number of scientists from a wide range of disciplines. The“Report of the Scientific Results of the Exploring Voyage of HMS Challenger during the years 1873-76” reported in addition to the fact that life does exist below 1,800 feet, findings such as: 4,717 new species; the first systematic plot of currents and temperatures in the ocean; a map of bottom deposits much of which has remained current to the present; an outline of the main contours of the ocean basins and the discovery of the mid-Atlantic Ridge. The report is an important work still used by scientists today. In addition to the report, Sir Thomson also wrote a book about the voyage in 1877 titled “The Voyage of the HMS Challenger”. 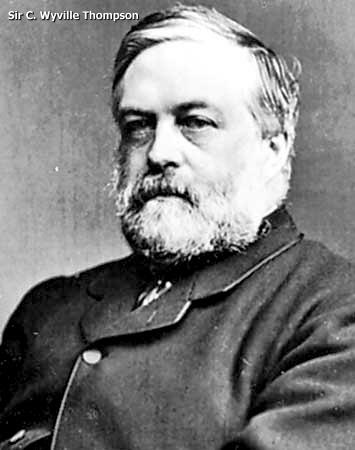 He also wrote one of the early Marine Biology textbooks“The Depths of the Sea” in 1877. These expeditions were soon followed by marine laboratories established to study marine life. The oldest Marine Biological Research Station in the world is the Station Biologique de Roscoff which was established in Concarneau, France and founded by the College of France in 1859. Concarneau is located on the northwest coast of France. The station was originally established for the cultivation of marine species such as Dover Sole “Solea solea” because of its location near marine estuaries with a variety of marine life. Today, research is conducted on molecular biology, biochemistry and environmental studies. In 1871, Spencer Fullerton Baird, the first director of the US Commission of Fish and Fisheries (now known as the National Marine Fisheries Service), began a collection station in Woods Hole, Massachusetts because of the abundant marine life there and to investigate declining fish stocks. This laboratory still exists now known as the Northeast Fisheries Science Center and is the oldest fisheries research facility in the world. Also at Woods Hole, the Marine Biological Laboratory (MBL) was established in 1888 by Alpheus Hyatt. The MBL was designed as a summer program for the study of the Biology of Marine Life for the purpose of basic research and education. The Woods Hole Oceanographic Institute was created in 1930 in response to the National Academy of Science’s call for “the share of the United States of America in a worldwide program of Oceanographic Research” and was funded by a $3 million grant by the Rockefeller Foundation. An independent biological laboratory was established in San Diego in 1903 by University of California professor Dr. William E. Ritter, which became part of the University of California in 1912 and was named the Scripps Institution of Oceanography after its benefactors. Scripps has since become one of the world’s leading institutions offering a multidisciplinary study of Oceanography. 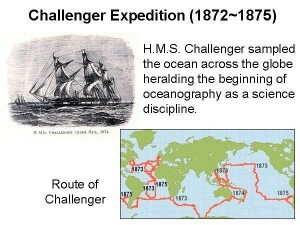 Technology brought the study of marine biology to new heights during the years following the HMS Challenger expedition. In 1934 William Beebe (1877-1962) and Otis Barton (1899-1992) descended 3,028 ft below the surface off the coast of Bermuda in a bathysphere designed and funded by Barton. 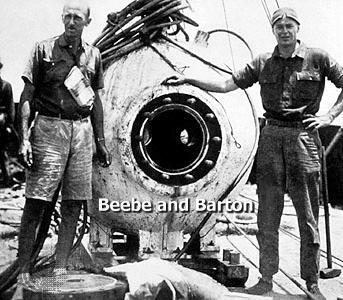 This depth record was not broken until 1948 when Barton made a bathysphere dive to 4,500 feet. During the interim, Beebe was able to observe deep-sea life in its own environment rather than in a specimen jar. Although he was criticized for failing to publish results in professional journals, his vivid descriptions of the bathysphere dives in the books he published inspired some of today’s greatest Oceanographers and Marine Biologists. In 1960, a descent was made to 35,813 feet or 6.78 miles in the Challenger Deep of the Marianna Trench, the deepest known point in the world’s oceans, near 11° 22’N 142° 36’E located about 200 miles southwest of Guam. The bathyscaph Trieste was built by Auguste Piccard. The dive was made by his son Swiss explorer Jean Ernest-Jean Piccard and U.S. Navy Lieutenant Don Walsh. The descent took almost five hours and the two men spent barely 20 minutes on the ocean floor before undertaking the 3 hour 15 minute ascent. The Trieste’s first dive was made in 1953. In the years following, the bathyscaph was used for a number of Oceanographic research projects including biological observation and in 1957, she was chartered and later purchased by the U.S. Navy. 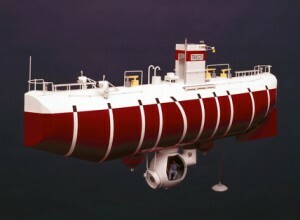 The Navy continued to use the bathyscaph for Oceanographic Research off the coast of San Diego and later used the Trieste for a submarine recovery mission off the U.S. east coast. The bathyscaph was retired following the U.S. Navy’s commission of the Trieste II and is currently on exhibit at the Washington Naval Historical Center.